Marie Osmond Is Married To Stephen Craig. Again. In March 2010 I told you about Marie Osmond reconnecting with her first husband after the death of her son, Michael; at the time there were rumors that the two were thinking of remarrying, but nothing ever came of it. Nearly 30 years after marrying former basketball player Stephen Craig and divorcing him three years later, Marie Osmond as met him at the altar once again. The singer’s rep confirmed to People magazine that the happy couple exchanged vows for the second time early Wednesday in a private ceremony at the Las Vegas Mormon Temple; a reception at their Nevada home followed. “I am so happy and look forward to sharing my life with Stephen, who is an amazing man as well as a great father to my children,” says Osmond, 51, who has a son, Stephen, 28, with Craig, 54. 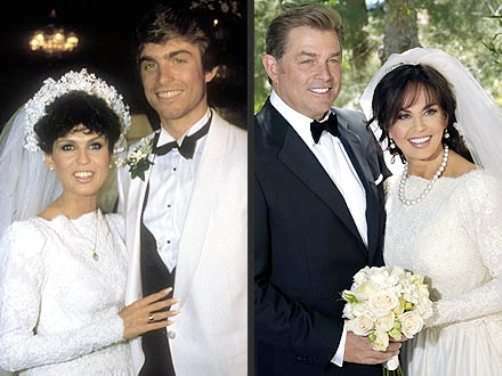 As if re-connected love wasn’t romantic enough…..Marie Osmond wore the same Ret Turner designed wedding dress at Wednesday’s ceremony that she wore back in 1982. Outdated perhaps, but a wonderful sentiment nonetheless. The date May 4th is highly significant to the couple as well. Wednesday’s wedding date is significant to Osmond and Craig as it marks the birthdays of both Marie’s late son Michael and late mother Olive. “It was important that both Michael and my mom were with us on this special day,” says Osmond. previous post: Jesse James Needs To Stop Boasting And STFU. Seriously. next post: More Celebrity Babies Born, More Crazy Names Given. 50 queries in 1.197 seconds.